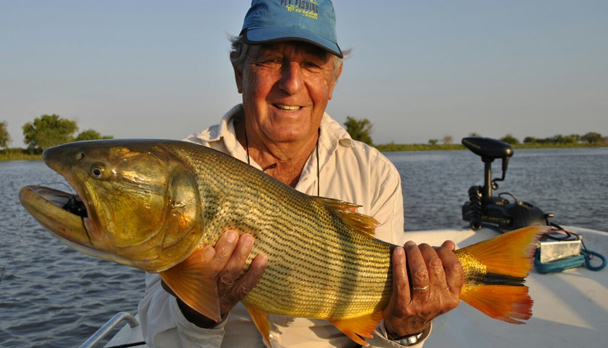 Enjoy the incomparable experience of fishing dorado surrounded by a unique landscape. Located very close to Buenos Aires (3 hours drive). 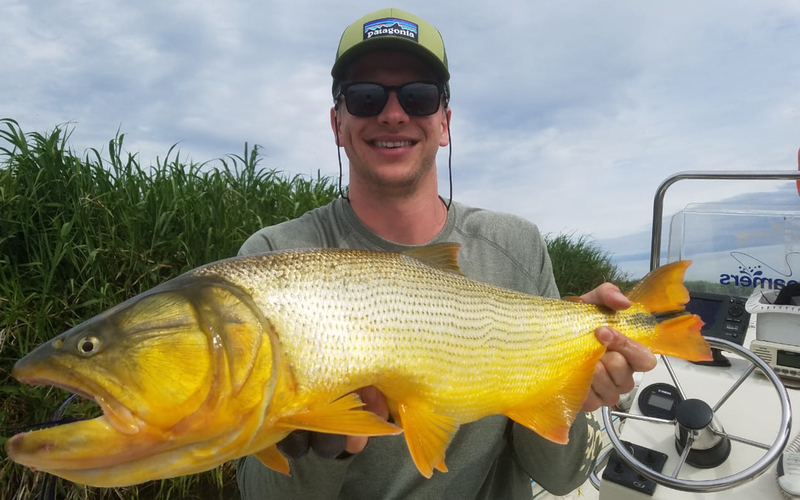 The fishing area consists of a delta where hundreds of streams and channels get together, giving home to the fantastic golden dorado with accommodation on board the Paraná Gipsy mothership. 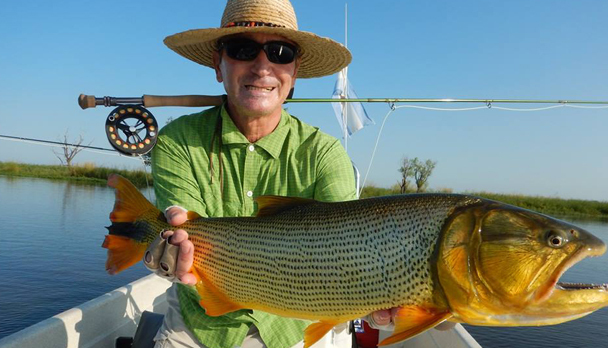 Enjoy the incomparable experience of fishing dorado with fly or spinning rod surrounded by a unique landscape. 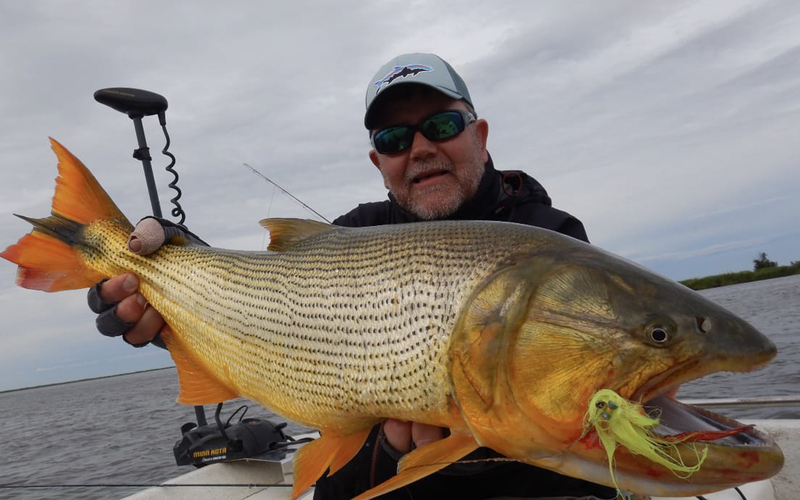 Located very close to Buenos Aires (3 hours drive), the fishing area consists of a delta where hundreds of streams and channels get together, giving home to the fantastic golden dorado. 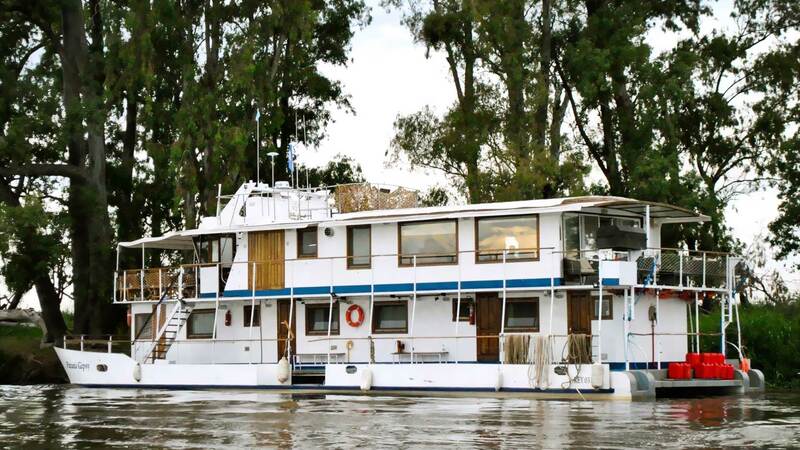 Accommodation on board the Paraná Gipsy mothership is a unique experience The season runs from September until May. The fishing boats are Carolina Skiff with 60 HP outboard engine and an auxiliar electric engine. 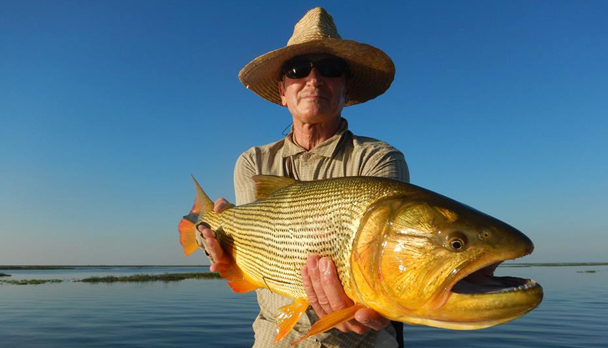 The guides are gently and quialify and knows very well all the area. 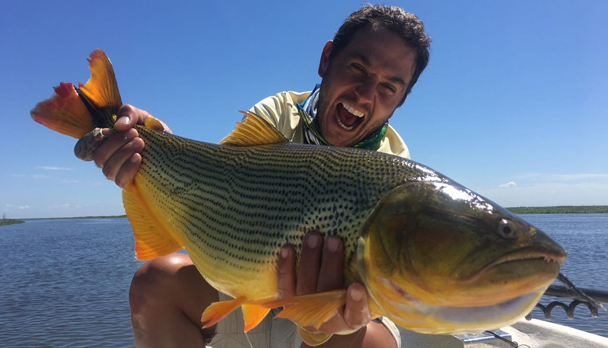 Their average size varies between 4,5 and 11 lbs, and can occasionally reach 20 lbs, with a minimum hookup of 30 fish per day per angler! 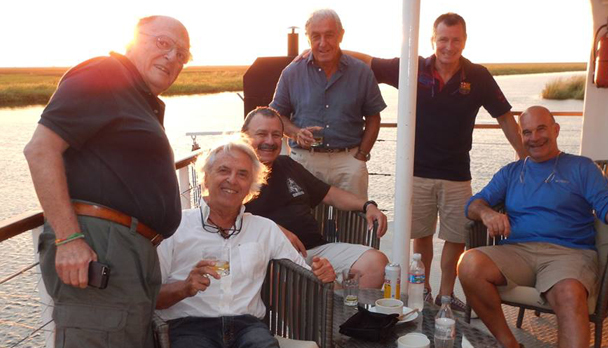 An ideal program for businessmen staying at Buenos Aires (international receptive tourism) and for all those seeking new adventures and destinations. Accommodation in the Paraná Gipsy mothership is great. The boat counts with 4 comfortable bedrooms with 2 beds side by side each, TV, air conditioning and private bathroom with hot water. The mothership counts with living/dinning room very well decorated, with a bar and great argentinian wines. The staff is very gently and the cheff is outstanding. Rods: Two, if possible. 9ft, # 5 Wt and # 7 Wt. 3-or 4- piece, if possible. Reels: A reel with a good drag system, holding at least 80 yards of 20-pound test backing. Lines: WF floating line and sinking shootings Teeny T-200. 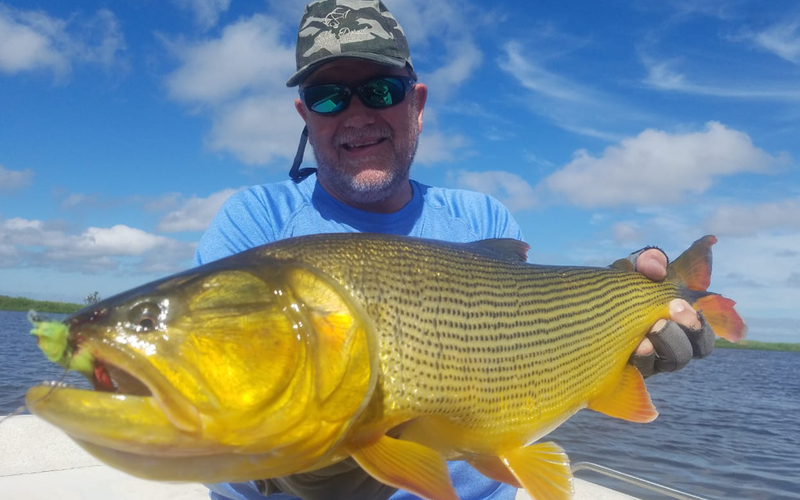 Leaders: for 5- to 7-foot floating lines with strong butts to turn big flies, 16-pound test tippets with 20 cm of 20-pound test steel wire. 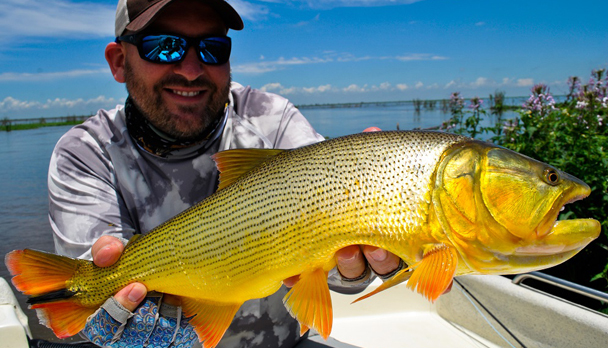 Flies: Hook size 2/0 and 3/0, Deceiver patterns. Also poppers and divers with muddler head, weighted. Colors: black, black and red or black and yellow, chartreuse, white and yellow and white and olive have proved good options. Accessories: tweezers, hook sharpener, nippers, etc. Lightweight shirts and pants (Exofficio, Patagonia, Columbia, etc), wide brimmed hat or cap, a lightweight waterproof jacket, a polar fleece sweatshirt, an extra pair of sandals or sneakers, polarized sunglasses, sunblock, lip protector. If you don't have fishing equipment we are able to provide you with one. Rates include: Boat transfer to the mothership; 3 night accommodation on board, all meals and beverages; 2 1/2 fishing days with guide and fishing tackle if needed. Rates do not include: Transfer from and to Buenos Aires. Personal insurance, staff and guide gratuities. 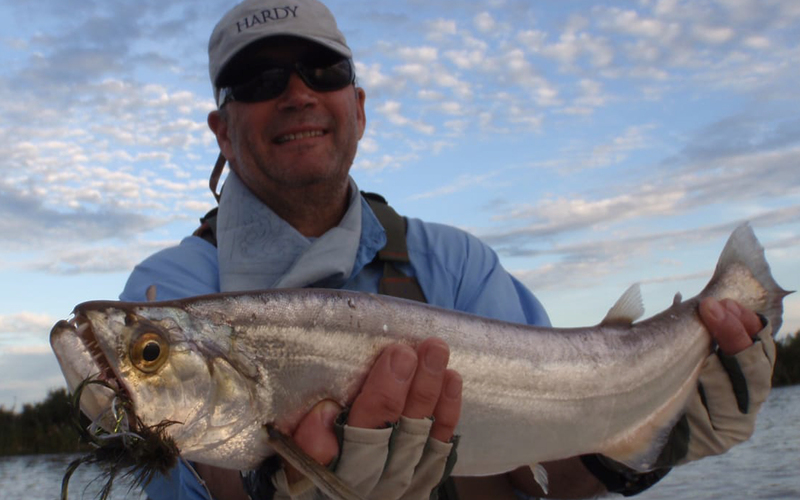 Notes: More fishing days are available upon request. 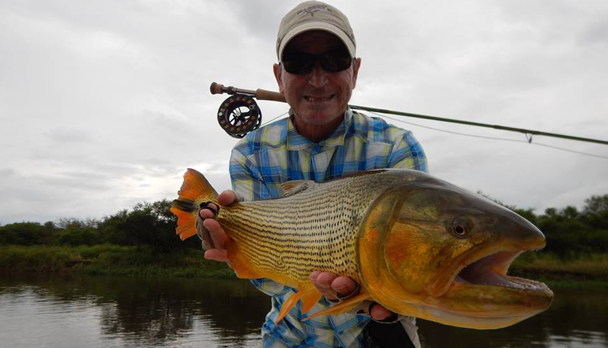 Good fishing despite the irregular weather conditions and the high waters due to constant rains. 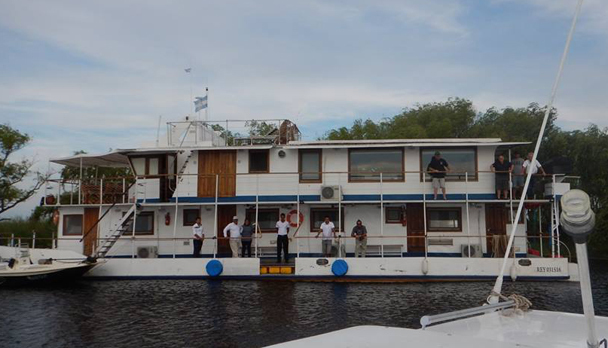 We departed from Buenos Aires on Wednesday 1st after lunch, arrived at 17.30 hs to the marina and hopped ina about that sailed us to the mothership Parana Gipsy, where we arrived at 18.30 hs. We unpacked in the impecable and sober rooms, with private batheroom and a/c. Talks, drinks, while preparing equipments and waited for the exquisit meal? then bed time. 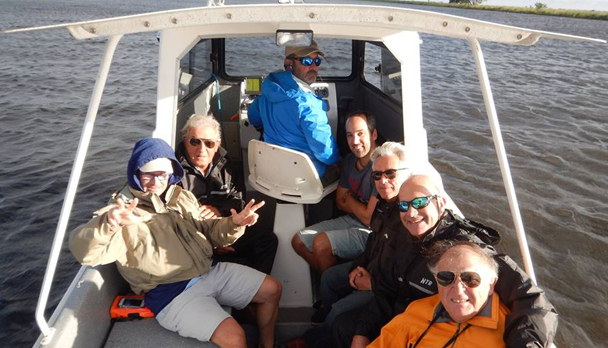 Thursday, we had breakfast at 8 am and departed fishing at 9 am. Friday and Saturday we rotated guides and fishing partners, just for variation. 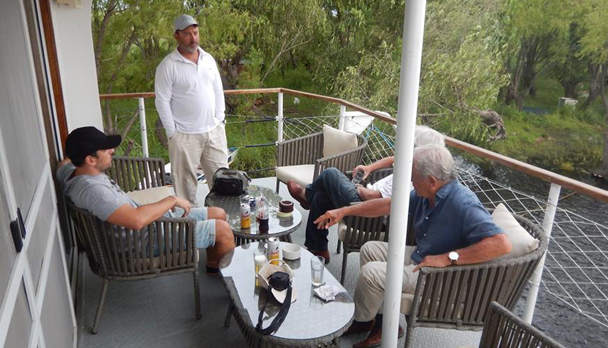 We returned everyday at 1 pm for lunch and a nap, and then back to the fishing boats at 4 pm to fish until 8 pm. 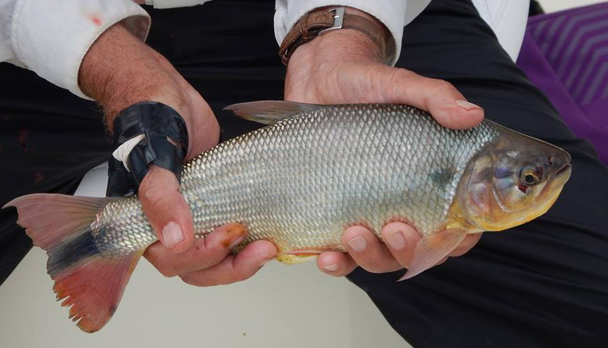 We fished an average of 100 golden dorados each, from very small one up to 9 lbs. during the 3 fishing days. 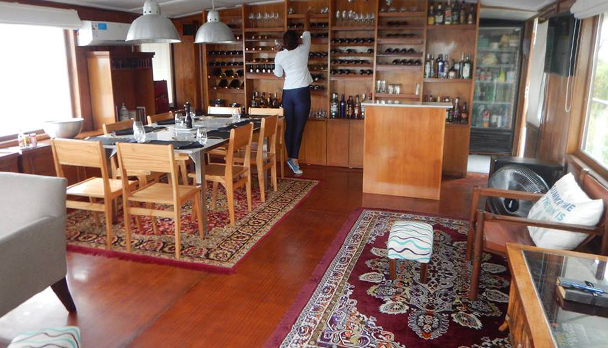 Epicurean food, wines from collections, first class service with a cosy and gentle touch. Sunday by midday I was back home. A special mention to the captain, head guide, pilot and leader Dario Arrieta. 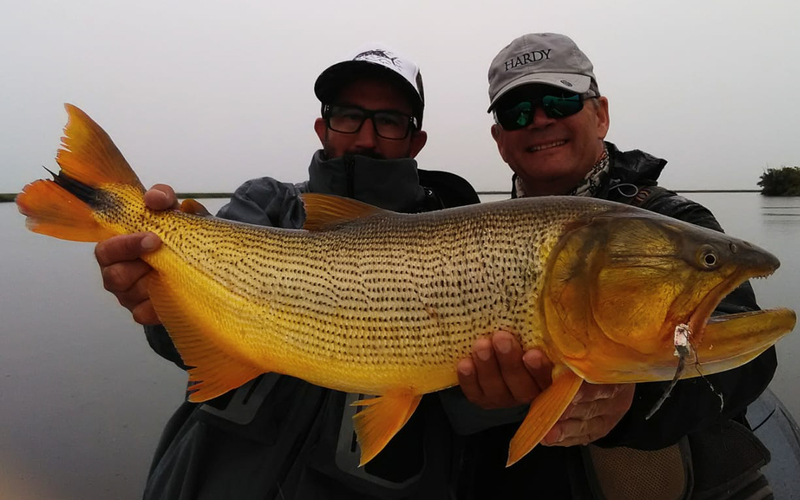 Congratulations to the operation Golden Dorado River Cruiser, for this spectacular program, which can also be enjoyed with family and couples. It?s also available for beginners and those who prefer spinning over fly. Bird watching is also a good option during this trip. Next time I would like to come along with my family! Quiero volver! / Want to return! The experience was amazing! The service, place and fishing were first class. I want to return next month!